TV timeout with Minnesota leading Wisconsin 2-0, 7:30 left in the first. Shots on goal are 12-2 for the Gophers. UW still looking for their first goal with 5:26 to go in the first. Minnesota leads in shots 14-2. Berry took a shot to the mask, knocking it off his head. He's getting it repaired now. Johnson takes a shot from the point but Berry makes the glove save. Just over four minutes remain in the first period. #Gophers will have their first PK of the game as Pitlick gets two minutes for hooking. Some offensive pressure by UW leads to a Minnesota hooking minor. Badgers will have their first man advantage with 2:15 to play. Gophers' Pitlick is called for hooking. Badgers go on their first power play with 2:15 left in the first, trailing 2-0. Badgers' power play is cut short as Frederic takes a hooking penalty with 1:38 to go in the period. Still 2-0 Gophers. UW's Frederic ends the power play with a hooking call. 4-on-4 for 1:24. The Badgers quickly even it out and pick up a penalty. Four on four hockey for 1:24. 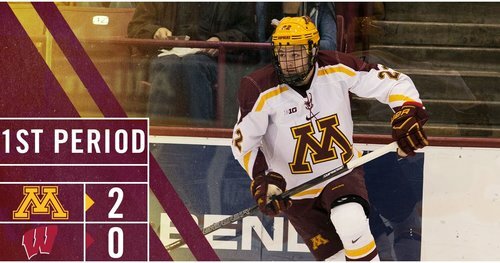 END 1: Minnesota leads Wisconsin 2-0 on goals by Bristedt and Szmatula. 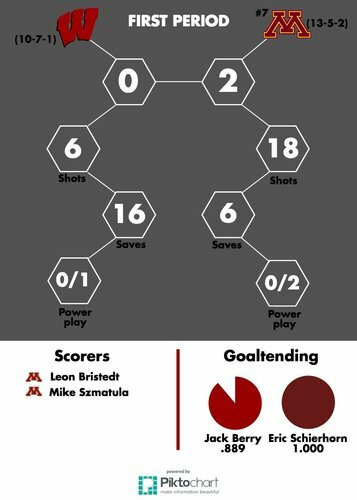 Gophers outshot the Badgers 17-6. Teams back out for the second period with Minnesota holding a 2-0 lead. They will have 22 seconds of power play time to start the second. Second period is underway. The Gophers have 22 seconds left on a power play, leading the Badgers 2-0. We are underway in the second period here at the Kohl Center! #Gophers start on the PP but Badgers are now back at full strength. BADGERS GOAL: Luke Kunin snaps one in from the left circle to cut the Gophers' lead to 2-1 with 53 seconds into the second. Goal, Wisconsin. Kunin gets the Badgers on the board to make it a 2-1 game. #Gophers will head back to the PK as Reilly is called for tripping. McGuire draws a tripping minor and the Badgers will have another power play. 16:26 to go in the second period. Gophers' Reilly goes off for tripping McGuire and UW has its second PP with 16:26 left in the second, trailing 2-1. Teams are back to 5-on-5 with the score at 2-1. Six minutes gone by in the frame. Good shift by UW's fourth line leads to a couple chances but no goal. Gophers lead 2-1 with 13:17 left in the second.